The team here at Australian Bowhunting Forum is made up of some very dedicated bowhunters who put a lot of time and energy into helping our pastime progress in a positive light as we move forward into the future. Each member has varying amounts of experience in different aspects of hunting with the bow and together we try to keep a balanced and fair representation of what our pastime is all about, whilst aiding in educating newcomers to the finer points of hunting with a bow. Together, with the very strong bowhunting fraternity that makes up the site, these aims are met on a daily basis and as a community that works together, we can only ever get stronger as one big unit. Below is a little insight into each member of the management team, just so you will know a little more about us and what we are about. Most of you know who we are already, as we are the same team that ran TBGA, but some newcomers may not know us at all. First up is myself, user name is my own. 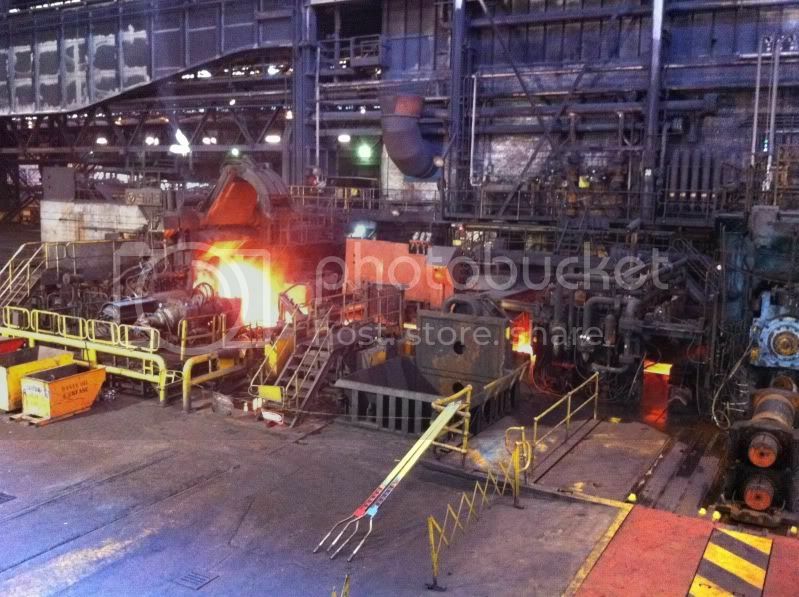 Occupation: Work in the Hot Strip Mill at the Port Kembla steelworks for Bluescope Steel. 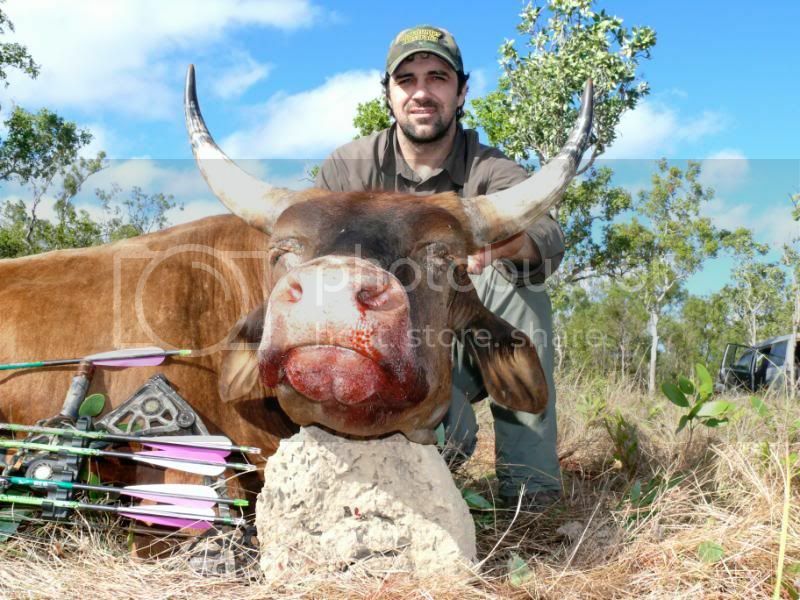 Also edit and publish South Pacific Bowhunter magazine and help run this site. Little bit about yourself: Have a wife and two kids, both girls aged 5 and 8. Played a lot of sport and surfed when I was younger. Used to be a mad keen fisherman until the bowhunting bug bit and has been a life of bows since then. When you started bowhunting: Started bowhunting in 2004 after a fishing trip to the Cape. A mate bought a bow for the first time and together we figured that thing out and I was hooked after following him around with the video camera. First bowhunting success: Took me eleven frustrating months chasing the local rusa around for my first kill, as we didn't have any rabbits or smaller game around to cut your teeth on. 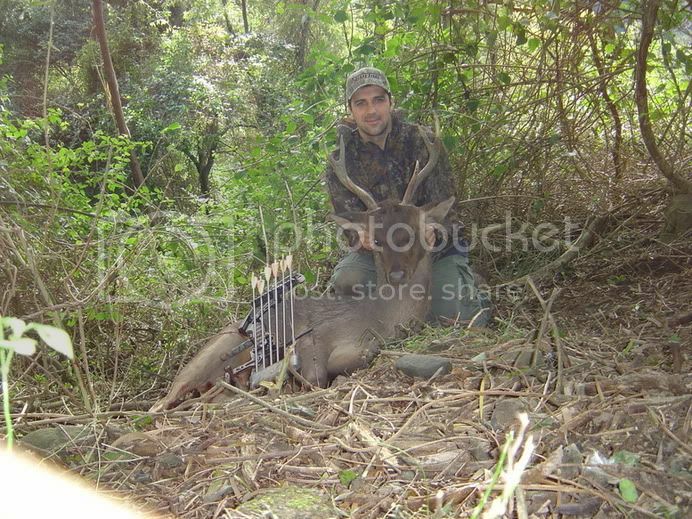 Took a young stag from 8m and then had the thought hit me of what the hell do I do now once he was laying at my feet. All that frustration of trying to take one and I never hardly put a thought as to what I would do if I ever did manage to get one. I eventually managed to get him cut up and carried that baby out under immense strain, but it was all very, very worth it and sent me on my way to an addiction that has had me hooked ever since. Who has been your main influence? : Been very lucky to have some great people, some now my best friends (bows and hunting tend to do that for you) who showed me the ropes when I kicked off. 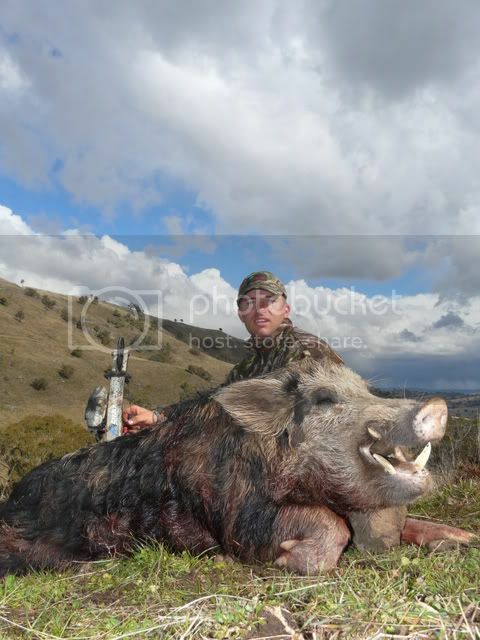 Pete Novakovic (Pego) was the one who showed me everything from tuning to shooting to butchering and utilising the meat from my game. I also had plenty of help from some of the very successful bowhunters from the South Coast crew like Jamie Lynch and Shane Coppin to name but a couple of them. These guys have literally taken hundreds of deer between them, so to garner knowledge from them at an early stage was invaluable. 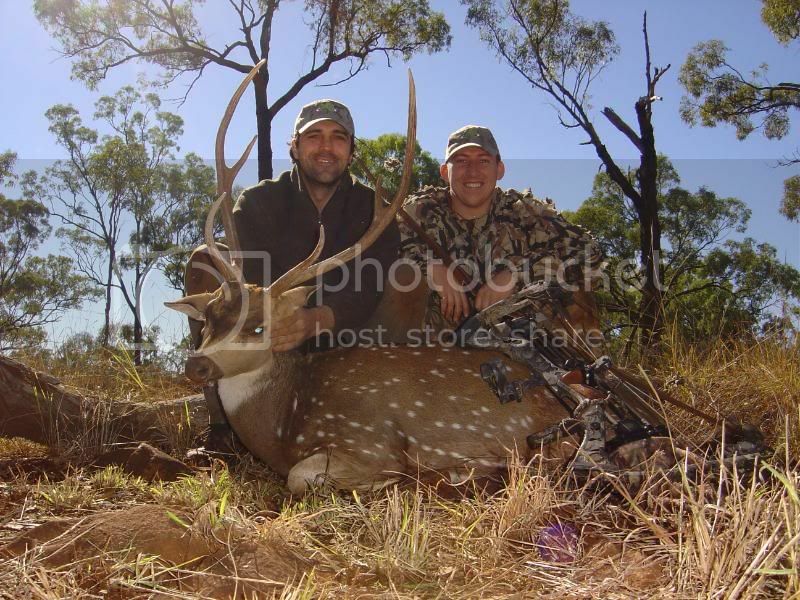 Another big influence has been a rifle hunter named Aaron, another of my best mates, who is one of the most knowledgeable and smart hunters you might ever want to meet. I also have the privilege of calling the likes of Wayne Preece, Brad Smith, Ian Fenton and Darryl Bulger friends and the guidance and knowledge that these guys have provided for many bowhunters for many years has been a mainstay of our pastimes development and I have been lucky to have received some of that. I also look up to the guys who manage this site with me and have called upon them for help on many occasions and probably the biggest influence overall has been this web community, as many of my friends and much of my knowledge has been garnered from it and the friendships that have been forged through meeting people here. 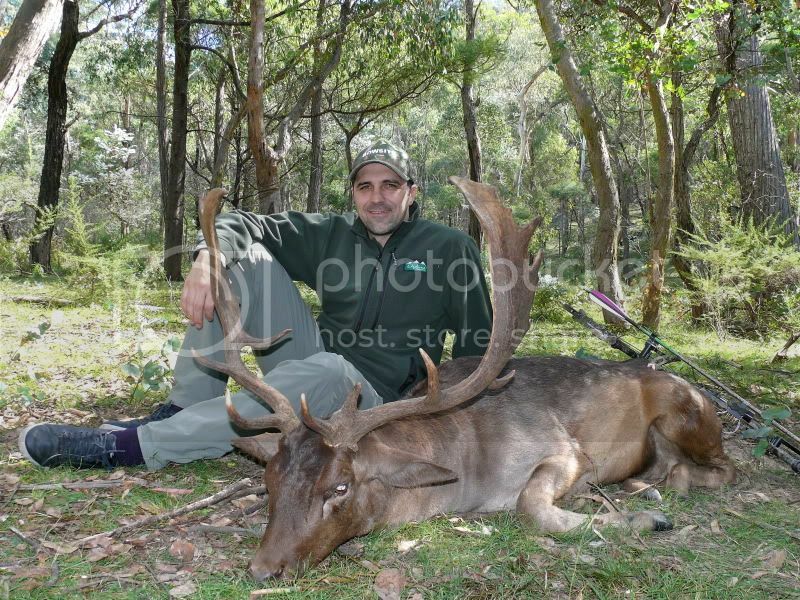 Favourite animal and style to hunt: Obviously Rusa are my first love. I cut my teeth on them and have never stopped chasing them. They are a very worthy adversary and I have gained much knowledge through being frustrated by them. All my hunting is spot and stalk and I wouldn't have it any other way. I will sit out an animal if needs be, but nothing is more fun than getting out amongst it and pitting your wits and skill on common ground with your game. 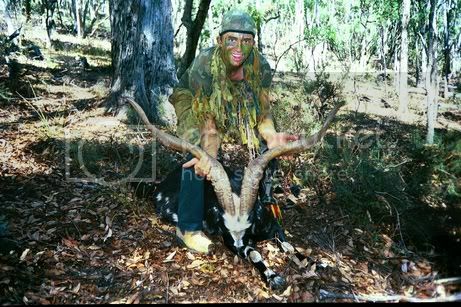 I also love to backpack hunt and my trips to the Vic Alps have been some of my most memorable ones. 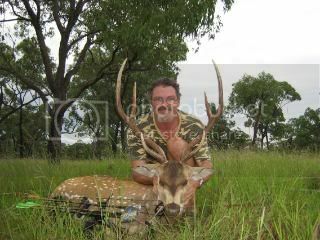 Have also enjoyed fantastic trips to the Top End, Cape York, Charters Towers for Chital and regularly chase Fallow, who are one of the funnest animals to chase in the rut in my book. Deer in general are my favourite animal to hunt and most of my focus in life is planning and doing trips to get after them. Gear that you use: Have been using a Mathews Drenalin 70lb in 30 inch draw for a number of years now, but have recently got myself a G5 Centroid that I will be putting through its paces for the next few years. Use Carbon Express Pile Driver Hunter shafts tipped with G5 Strikers. I have also used Zwickeys, Blackstumps, Outbacks, Thunderheads, Slick Tricks and Montecs and will soon try VPA heads, as they look very neat. Have a Scott Sabertooth release. Use Leica optics and Nikon rangefinder. Day pack is a Camelbak Commander and multi day pack is a Sitka 45. Boots are Asolo and Alpina. Have Spott Hogg and Limbsaver sights on my bows and Doinker stabiliser. Spott Hogg rest and Sims quiver. 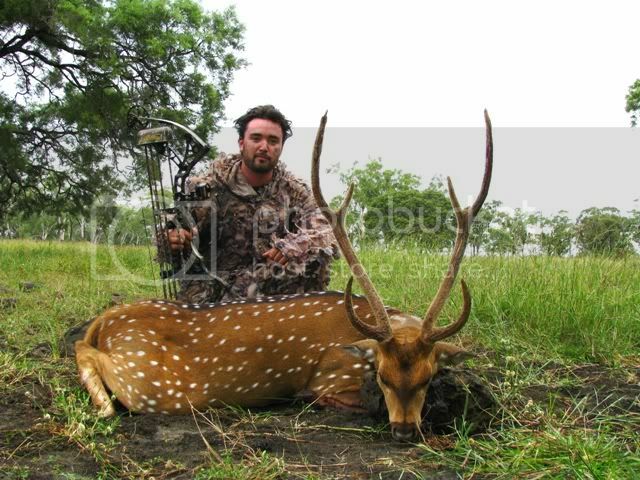 Species hunted: Have taken Rusa, Chital and Fallow deer. 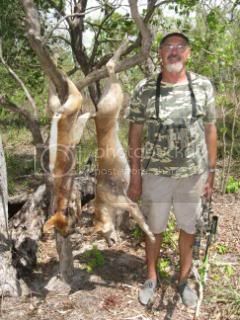 Have chased Sambar for no luck as yet and Reds will be on the menu for next year. Have also taken pigs, scrub bull, goats, foxes and a few bunnies and will be chasing buff soon. General view on the future of bowhunting and some tips to share: I see bowhunting right now in a very strong position, with numbers that have been steadily rising over the past five or so years. I also see us as very vulnerable at the moment with the advent of modern media, in particular the net, and it is us as today’s bowhunter who has to ensure that we always put the right foot forward when presenting our pastime in the public frame if we want to be able to enjoy doing what we do going forward and for future generations to get into it also. The rise of the do gooders is our biggest threat and we need to work together as a community to protect our right to hunt or else we would be doomed. Before the crash of TBGA, we had over 6300 members and that is saying something when you consider that it took 5 years to crack 1500 members and then in the following 3 or 4 years after that we had a huge growth. This just shows how many people are coming into the fold in recent times and hopefully this new look forum will take us back to where we were in no time. It will take an effort from us all, but we all know the value in sharing what we know and you can be rest assured that we will all be doing what we can to ensure people are guided, inspired and educated going forward. Where you live: Currently Chinchilla, QLD - although originally from Tully/Mission Beach, FNQ. Little bit about yourself: I'm married (as of 27th August 2011) and no kids as yet. Was born into bowhunting circles and will always be very thankful to my old man for that. 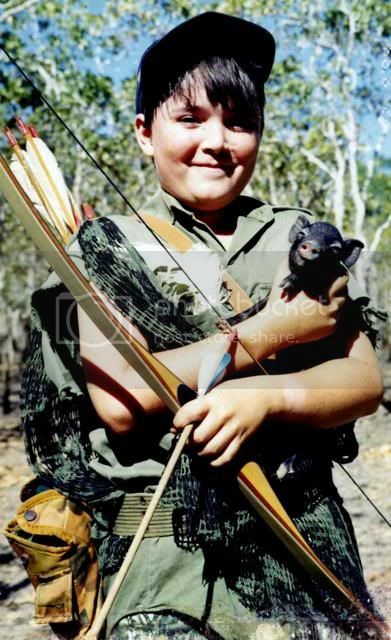 From an early age I had little choice but to carry a bow around. 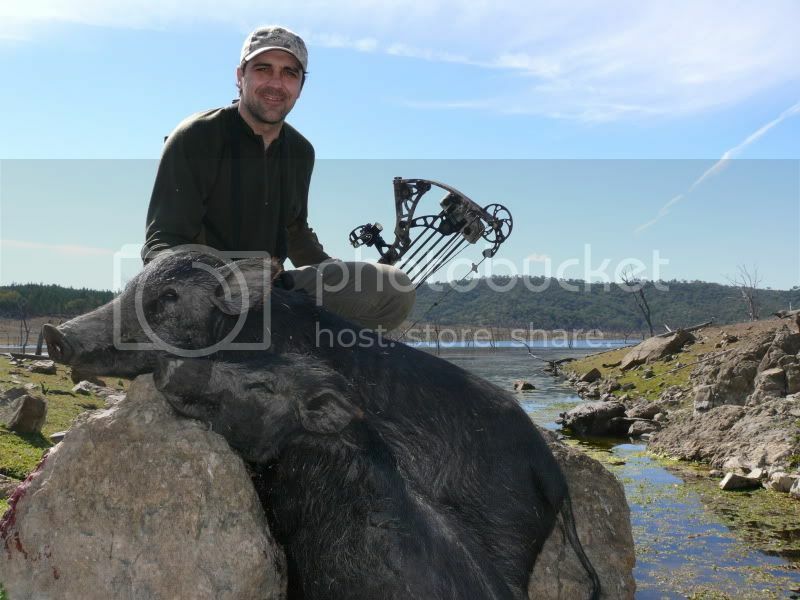 Bowhunting and all that comes with it is my main passion in life, work just fills the gaps between hunting trips. 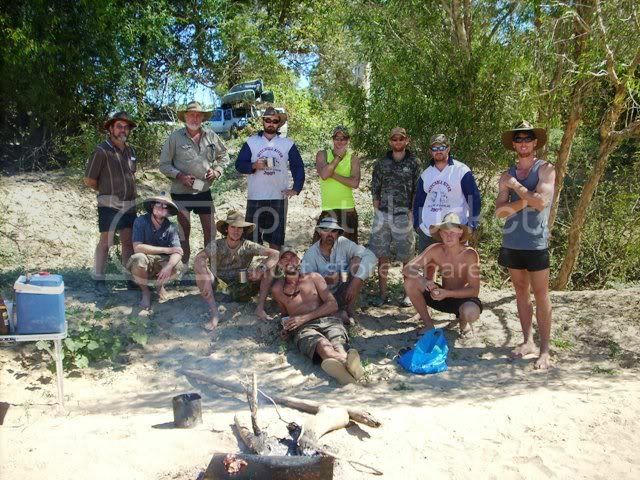 Spending time in the bush with good mates is always the focus, the odd trophy here and there is a bonus. 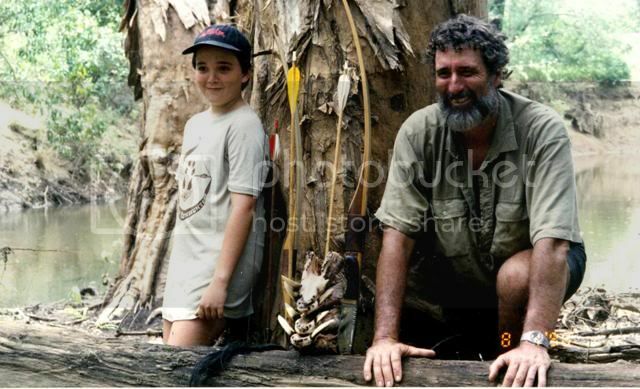 When you started bowhunting: I was following the old man around through the bush from age 6.
Who has been your main influence? : Directly - Dad, Bill Hill, Cliff Chew, Dave Keable, Albert Agale, and all the other mates I’ve shared a campfire with. Through magazines, stories and photos over the years, the likes of Brad Smith, Allen Davies, Mick Watts, Brett Vercoe, Mark Ballard, and the Southwells and Stojanovskis have also been inspirational along the way. 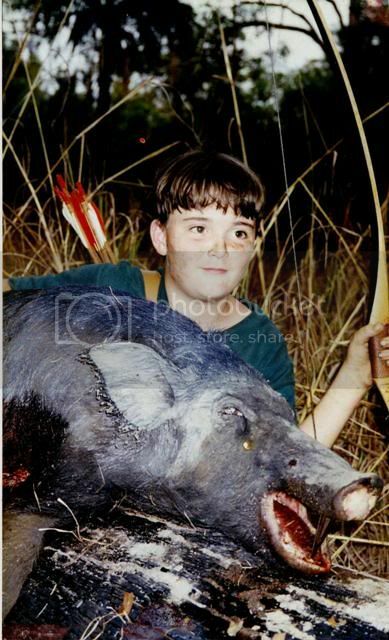 First bowhunting success: A good sized sow with my 30lb Cliff Chew ‘Taipan’ Longbow, on the Skardon River in 1994. 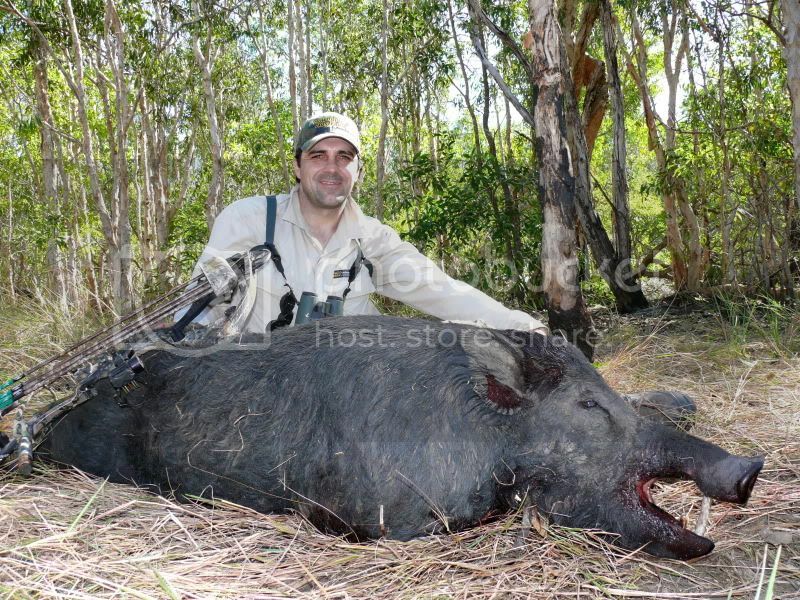 Favourite animal and style to hunt: While I love variety in hunting and will do everything I can to hunt as many species as possible during my lifetime, home will always be where the heart is, and the Cape York boar will always remain favourite. 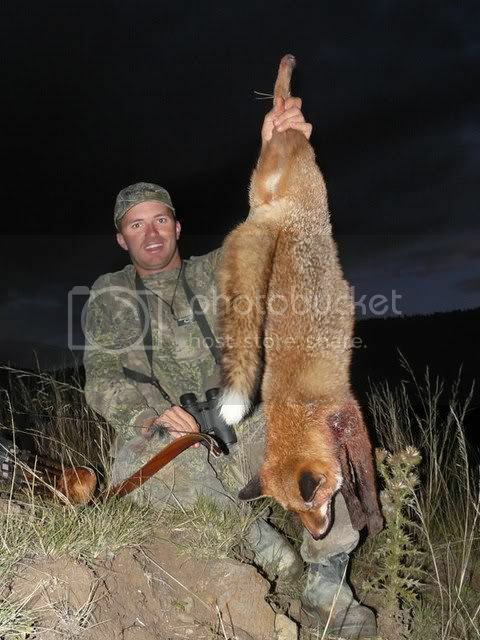 Late season, close range hunting in remote and wild country is the style I enjoy most. 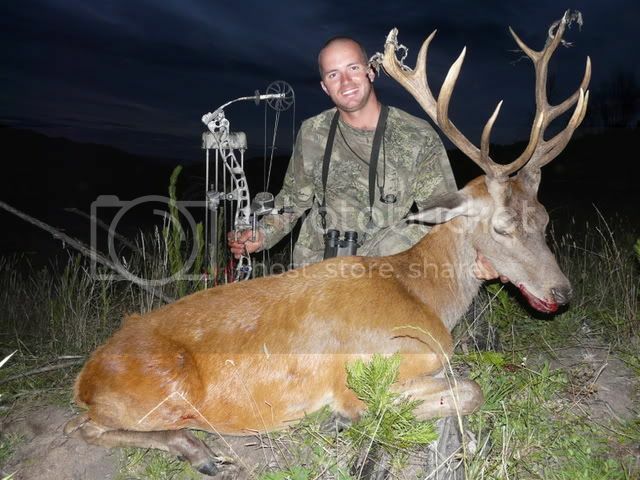 Gear that you use: Currently using a Hoyt CRX35 (70lb @ 29.5”); with Trophy Taker Extreme FC rest; Tru-glo Extreme Micro-adjust 8-pin sight and Special Custom strings. My arrows generally range from order to order, but most importantly at the business end I use Blackstumps for all applications. 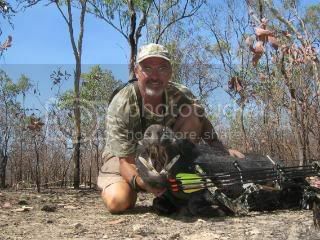 In terms of hunting attire I use Ridgeline camo clothing and Badlands packs - and find this combo perfect for the Aussie bush. 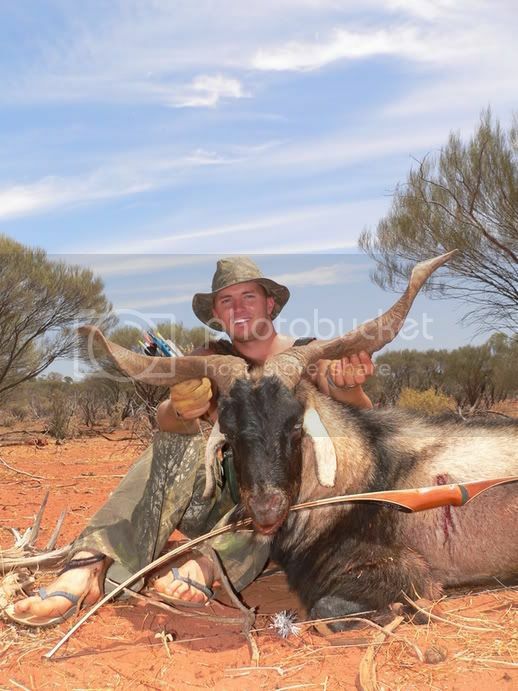 Species hunted: I have taken boar, water buffalo, scrub bull, chital deer, fallow deer, rusa deer, red deer, feral goat, dingo, fox and rabbit in Australia. 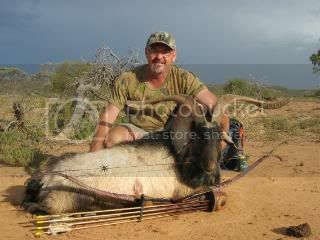 Also kudu, impala, warthog, eland and blue wildebeest in South Africa. I’m looking to settle some scores with fallow bucks and red stags next season, and there’s also a bull elk and bull moose out there somewhere that’ll be in grave danger later in 2012. 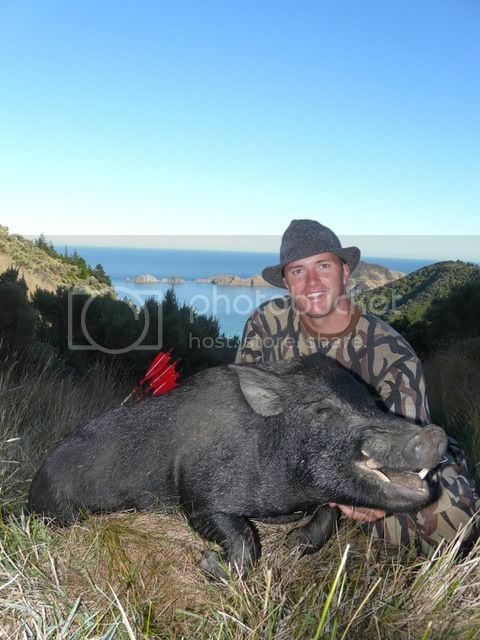 In the long term I will be exploring more of Africa; chasing blackbuck and red stags in Argentina; stalking Ibex in Asia; spending some time on the ungulates of NZ; and at some stage sorting out a nice Hog stag and Sambar. My ultimate goal in bowhunting though is to take a Rocky Mountain Bighorn, which I plan to start working on in the next few years. General view on the future of bowhunting and some tips to share: To be honest I reckon there a few forces that are changing the scene right at the moment, and how we manage things over the coming years will have a huge influence on the future of our pastime here in Australia. While bowhunting in general appears to be getting more and more popular, those incidents which shed a very negative light on us also seem to be increasing. Concurrently, I feel as though we in Australia remain far too segregated between the different groups, crews, associations, companies, clubs and disciplines. These separations are by far a bigger threat than the antis who are out there working to wipe us out right now. Although there have been some glimmers of hope recently, we’re still way off the mark, and unless there’s some serious pride-swallowing and mind-opening over the next few years, I fear we are running a huge risk of losing what we have. In terms of tips, I’m certainly not one that should be offering any, although in terms of hunting, listening to the old blokes has always helped me (I think). In terms of gear and technology, I reckon ultimately you have to try things out for yourself to understand what works best for you, rather than listening to advertising or what you’ve heard from someone. Get out there and grass some game and you’ll soon get a feel for what works and what doesn’t. 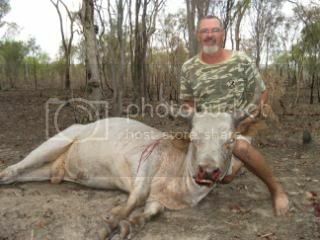 Little bit about yourself: I was born in Goondiwindi many years ago and worked for the NAB for 23 years until starting my Safari Business in 2002/Broadheads in 2011. Being born and bred on the land it was like going home to be back full time in the bush. When you started bowhunting: I started Bowhunting in 1995 after seeing my next door neighbour practising in the back yard. 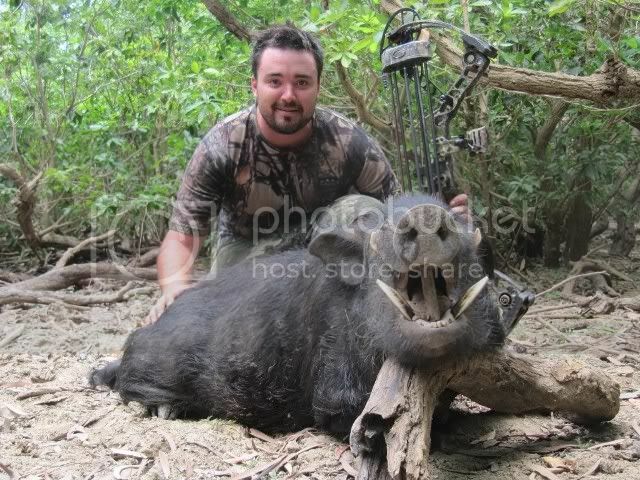 I took my first animal a hog the same year and haven't really looked back. Who has been your main influence? 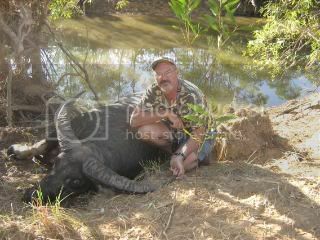 : I would have to say Steve Kidd has been my biggest influence and we have been hunting together now for some 17 years. We can't stand hunting together but that's a whole other story. 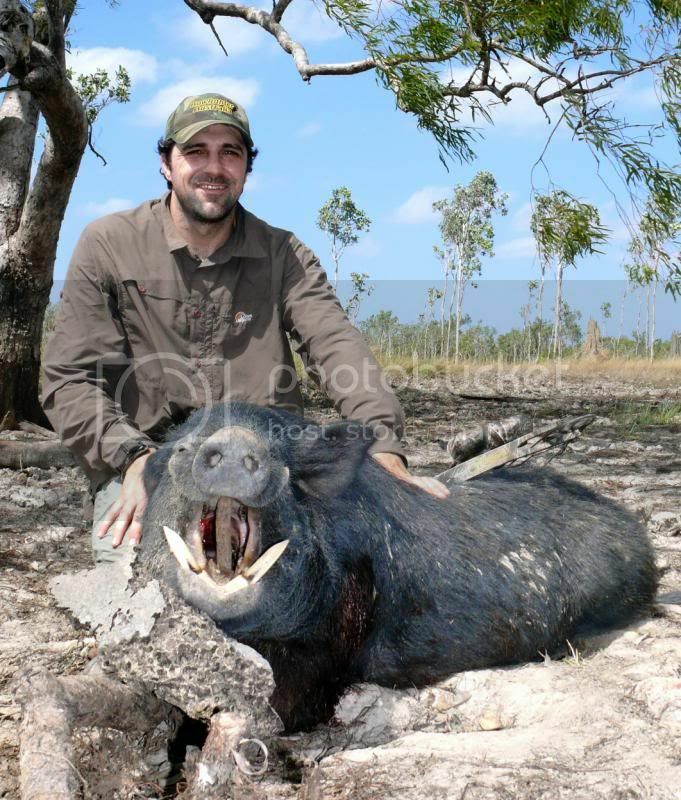 Needless to say he hunts at 1 mph and me at 30mph, so the two don't mix...lol..but we have a great camp and the competition is fierce, mind you he's getting old now...lol..
First bowhunting success: I took my first hog in 1995 and managed to get the No 1 boar in the ABA in 1996 a 33 6/8dp Boar. To date I have taken the following 1000+ hogs, 200+ Goats, 10 Buffs, 6 Scrub Bulls, 30+ Brumbies, 12 Dingoes, 15 Chital, 2 Rusa, 6 Foxes & 10+ Rabbits. I feel My best success has been to take a Buff with all 3 bow styles. 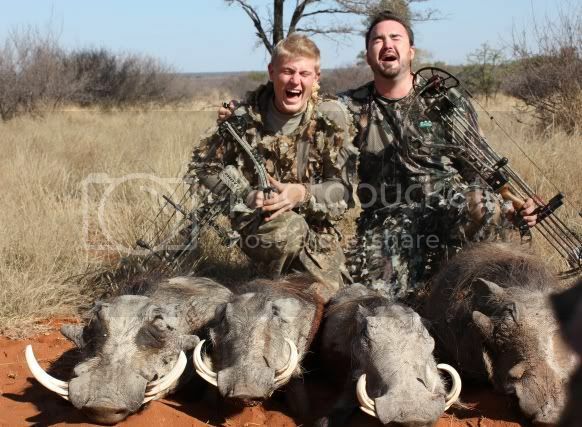 I also love to see my Clients taking their First Animals or PB, the look on their faces is what it is all about. 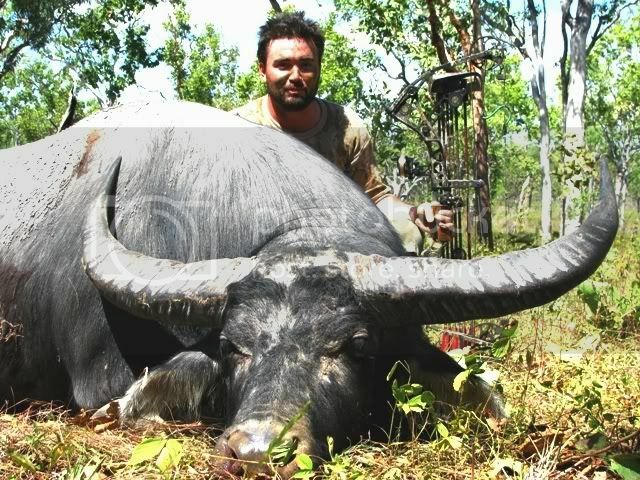 Favourite animal and style to hunt: I love hunting all animals and have done so with Longbow, Recurve and Compound. I prefer recurve as I like to get real close and personal with the game. Gear that you use: I currnetly use the folowing, Black Widow Recurve 61lb, Black Widow Longbow 67lb and Diamond Black Ice 70lb. 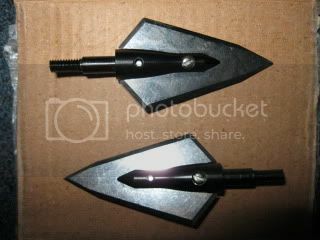 Easton Axis N-fused Arrows and of course Widowmaker Broadheads. 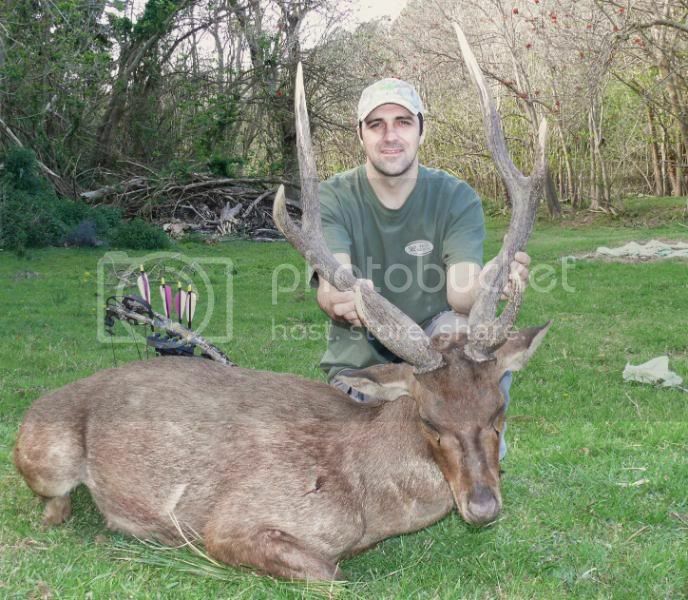 Species hunted: I hunt all species and am currently working on taking my first Sambar. 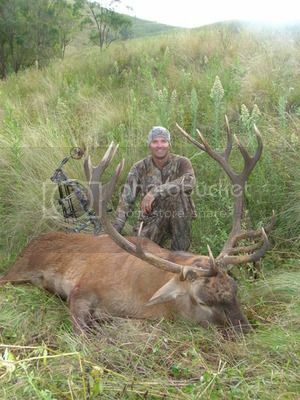 I have a trip to Colorado in 2012 to chase Elk, Bear and Mule Deer. General view on the future of bowhunting and some tips to share: I hope we will be bowhunting for many years to come and this is not only for the hunting but as you know it is my Bread & Butter. I couldn't go back to working for anyone again. 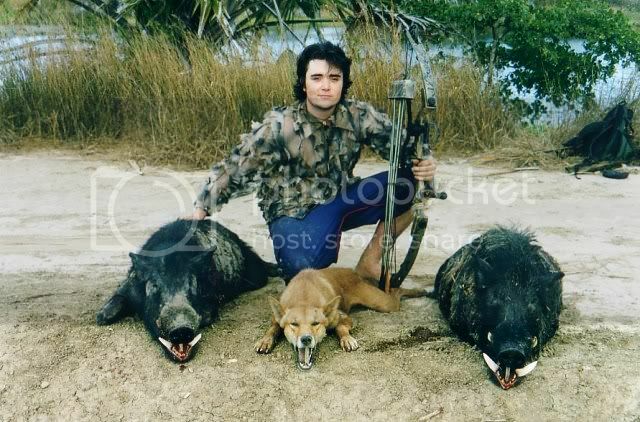 Tips, well you just need to enjoy your hunting and do your best to be professional in your endeavours. All animals deserve the respect. Just get out there and do it. I see to many armchair hunters these days who always have an opinon on things they know nothing about or have never experienced it. Hunter Valley, New South Wales, live in the very lovely City by the sea Newcastle. 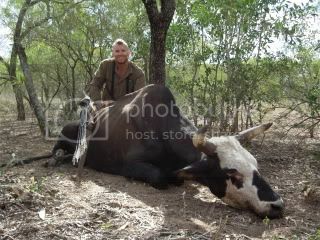 Spent all my younger years in rural New South Wales, hunting, fishing, horse riding typical country boy stuff. Mostly done home schooling because of our remote locations (might explain my bad gramma). 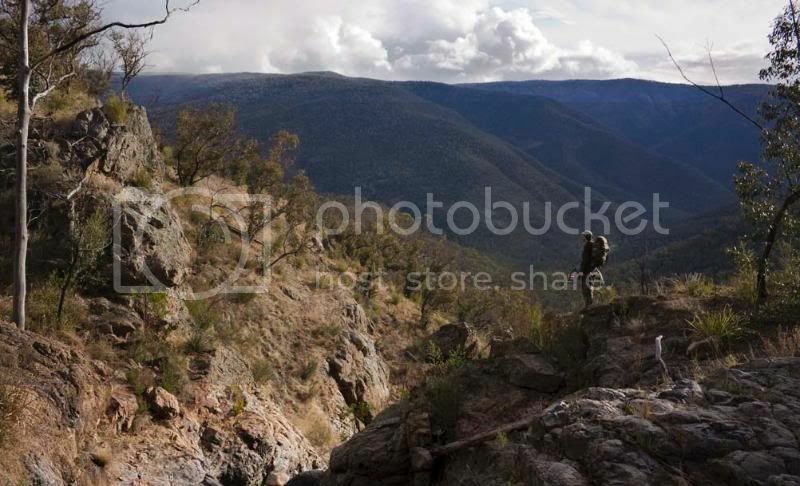 Teen years mostly spent in Newcastle and Canberra, Followed the construction industry around Australia and now have a construction company in the nor west of Western Australia, The business takes me into some remarkable landscapes some of that is the most untouched hunting land in the country. Beautiful bride of 10 yrs Kim Greentree, three gorgeous children Hunter 7yrs (I didn’t choose the name by the way) Noah 4 yrs and Aaliyah 2yrs old, my family is my best trophy of all, it’s my greatest achievement and my main passion in life. The rest lay ahead of me, hopefully good times with loved ones and great hunting. 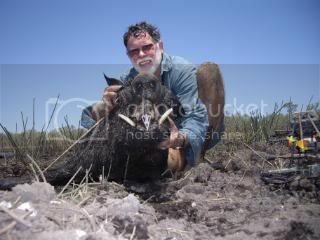 Seriously in 97, 15 years, but it feels like a life time, I hunted a few years prior to that also with some very basic traditional equipment. I shot rifle since the age of six mainly for vermin management and Recreation. I wish I had been introduced to archery much earlier, Bowhunting beyond my family is my only passion, there’s no other hobby that I do. So many good bowhunters out there, good men I should say. 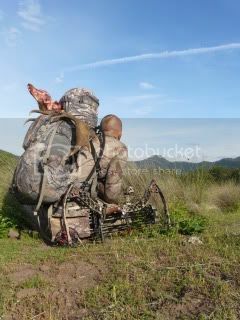 strive to share the hunt and promote bowhunting. with these mates, I can never get enough of there albums and stories to go with. off on me a bit. Learnt heaps from all and you take the best with you. And anyone that hunts with a bow makes me keener to hunt. 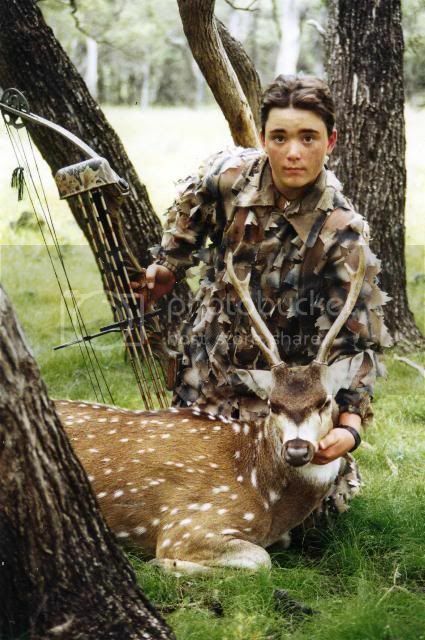 I hunted pretty solid for two mouths with tons of practise in that time also, I could hit a ten cent piece nineteen out of twenty times out to thirty meters, just had to find the game and stalk it to close the deal. 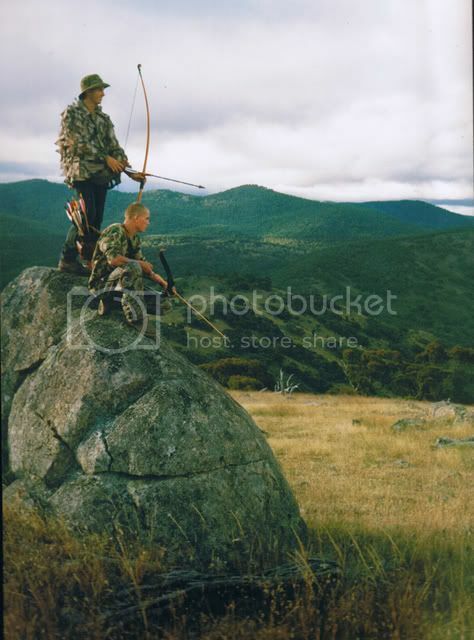 Myself and two good mates were hunting in the southern highlands in the very back blocks of a large property in the mountains. 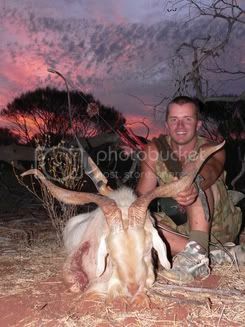 It was only about the 3 goat I had ever hunted. It was this big old shaggy billy not far from the top of the ridgeline in semi cleared country with big old gum trees scattering the mountains. Anyways I was shooting a martin firecat xrg pro series compound I came to full draw and settled up on the billies vitals and released, watching the arrow strike its destination. 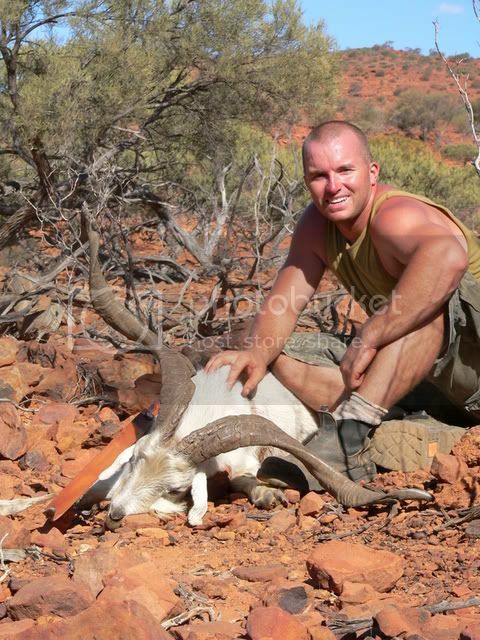 The billy fatally hit headed straight down the mountain and dropped after crossing a stream. 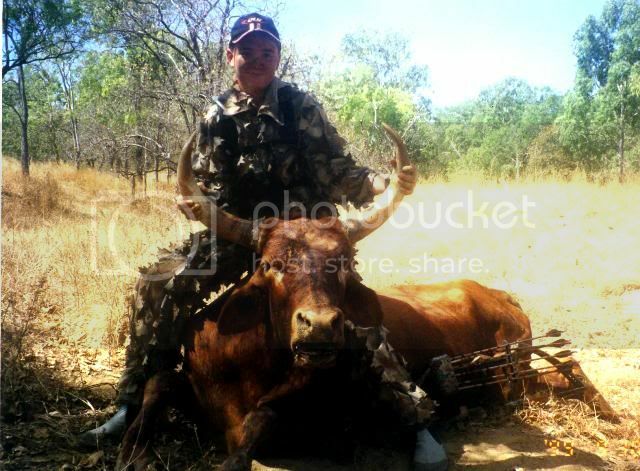 I had no idea that the billies horns were such a big trophy at the time but rather took the skull because it was my first bow kill rather then 49 inches 139 5/8 Douglas points, at the time it was second biggest rated with trophy takers. I’ve wrecked myself looking for one bigger ever since. 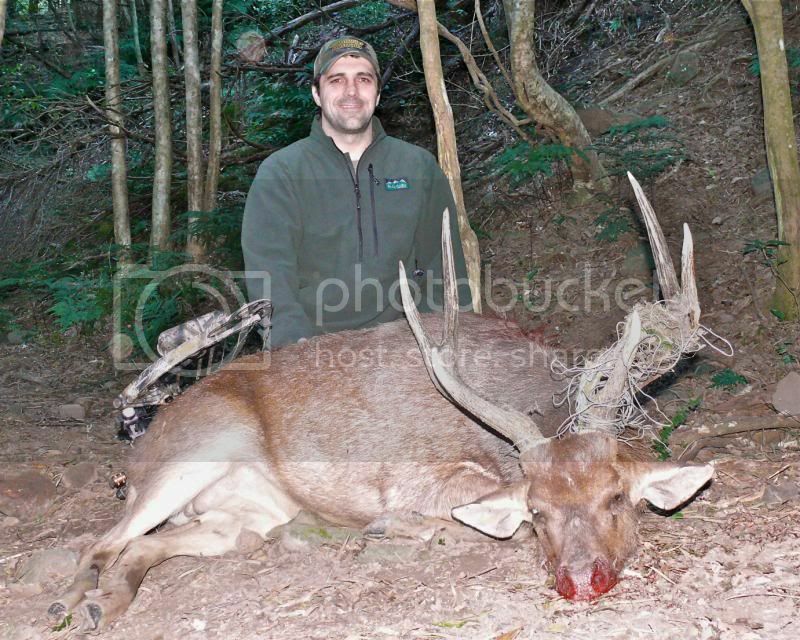 Fallow bucks before, during and after the rut, especially out of the mountains. Add to that hiking over a few nights to a week right in amongst there grounds, living, breathing and sleeping in their immediate areas. Setting camp up high and spending the first few days glassing for a certain antlered buck and patterning that buck before getting the drop on him using spot and stalk. Hoyt Carbon Matrix RKT set on 70 #, sweet as to hunt with especially on big pack hunts, its rigid but very light. Sure-loc Lethal Weapon sight, tight spot quiver, Trophy Taker Smack Down fc rest, Fuse Carbon Blade Stabilizer, Winners Chioce string, g5 peep, Carter Quickie 1 release, it’s a great set up for bowhunting. 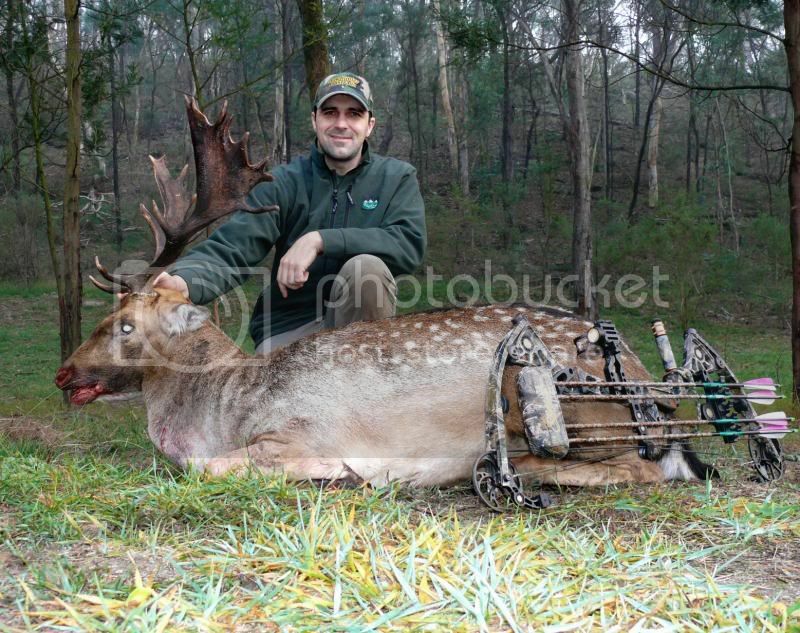 I thrash all my gear and my bows are no different they take the grunt of it. Carp, Shark, String Ray, Rabbit, Hare, Feral Cat, Fox, Wild Dog, Dingo, Turkey, Coyote, Pig, Goat, Fallow deer, Red Deer, WhiteTail Deer, Feral Horse, Scrub Bull. 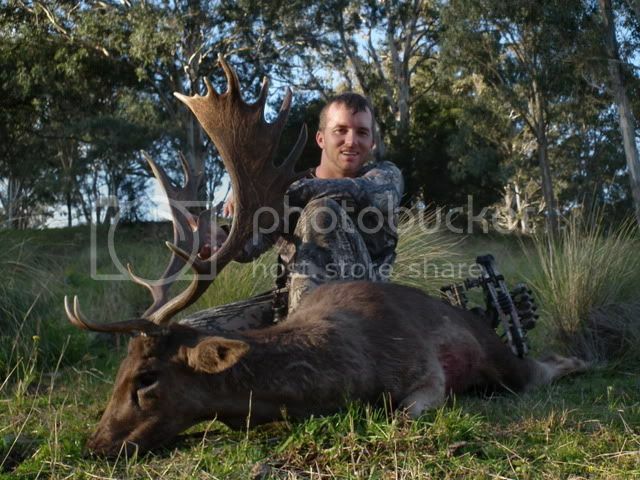 The future looks good for Bowhunting from what I see and hear, Numbers are increasing dramatically, Game Council was a massive positive for the health of bowhunting in Australia and they continue to grow stronger with support. 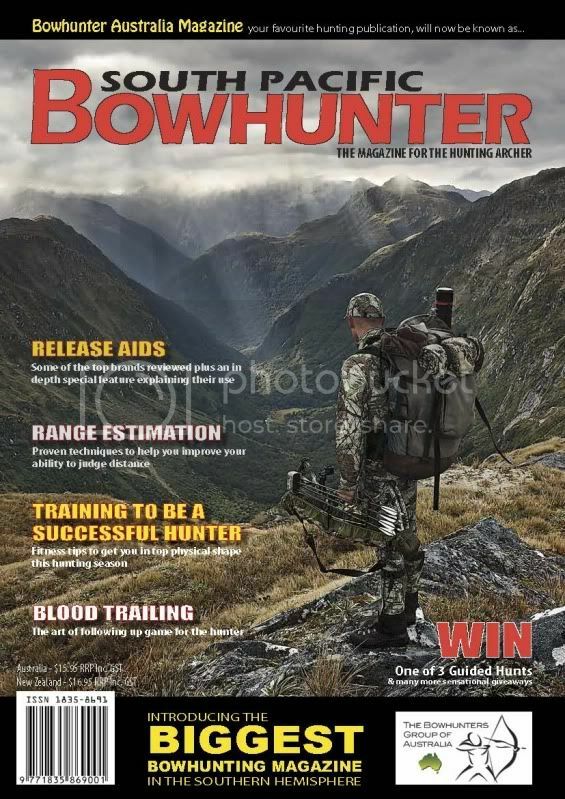 Top Shelf magazines, quality productions and Moderated Web sites promoting hunter and game in the ethical harvest of animals along with hunter educations and public appearance is very strong today and I feel this is pointing Australian Bowhunting in the right path for a long future. Tips, get out there hunt hard and make your own opportunities.